The electric guitar is an iconic musical instrument that has defined many musical genres, especially rock music. Over the course of its roughly 70-year history, the electric guitar has evolved into many kinds. To make it easy for you to choose your instrument, we have the "How to choose an electric guitar" guide for you. Mass popularity was gained by the electric guitar in the 1950s when Fender came out with the Stratocaster guitar. This instrument is still produced almost unchanged today and could be considered as the basis and essence of an electric guitar. If needed, our experts will be happy to help you make up your mind at the telephone number 020 8089 1481 (Mon-Fri 9 am-5 pm) or at the e-mail address . Today we distinguish three main types of electric guitars and many derived from them: Stratocaster and the Telecaster (which is originally from the manufacturer of Fender) and the Les Paul originally created by Gibson. It is difficult to clearly say which type of guitar is exactly suited to which kind of music. Although it might sound surprising, we are inclined to believe that the basic criterion for choosing an instrument may just be choosing what you like : -). An electric guitar that you will enjoy and feel good with will surely please you the most and you will have fun learning on it. The Stratocaster guitar was originally created by Fender. ST models are so vital that we can find them in the portfolio of other manufacturers. These instruments are among the most versatile type and are fine for all musical genres. No beginner will go wrong with this guitar. You would find Stratocasters in the hands of guitarists such as Jimi Hendrix, Eric Clapton, or David Gilmour (Pink Floyd). Les Paul guitars feature one cutaway on the underside and a rounded top. Their characteristic round and powerful output signal thanks to the double humbucker pickup is very well suited to hard rock genres, metal, but also styles such as reggae or blues. Giants like Slash (Guns N 'Roses), Jimmy Page (Led Zeppelin), Zakk Wylde swear by Les Paul guitars. Telecaster guitars are another iconic guitar coming from Fender workshops. Like Stratocasters, T models have become popular worldwide and are now available from other manufacturers. Their elegant shape with a single cutout and configuration destines them for a clean to a slightly distorted sound. Typically, these guitars appear in genres like country and pop, but nowadays there are also telecasters designed for harder music. 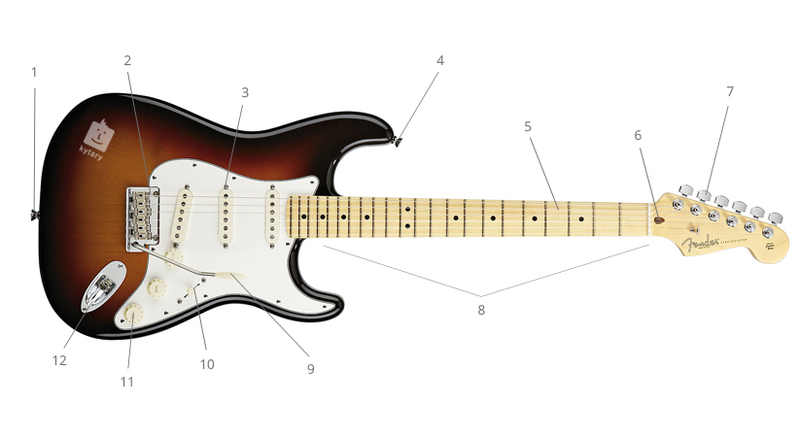 So-called Super Strat models are based on the Fender Stratocaster body design and shape. They are characterized by a narrower body and neck, deep cutaways with sharp corners, and overwhelmingly these instruments are fitted with at least one twin-coil pickup (humbucker). These characteristic elements destine Super Strat guitars for use especially in the hard rock and metal genres. SG guitars are inherently connected with Gibson, but like other types, we see them today with other manufacturers. These instruments are typical on account of their side-symmetrical body with two cutaways. You can typically see AC / DC guitarist Angus Young with an SG guitar. As opposed to all other electric guitars, the semi-acoustic guitar features a hollow body. Thanks to the acoustic space inside the instrument body of the semi-acoustic guitar, they have a typical warm and round sound. You will most often encounter this type of instrument in jazz and blues music. 7 string and 8 string guitars are gaining ground especially in modern metal genres. Thanks to the seventh or even eighth bass strings, these instruments can be played deeper than standard guitars. They are designed to play deep guitar riffs that were made famous by nu-metal bands like Korn, or "Djent" bands like Meshuggah. Baritone guitars are six-stringed, but due to the extended distance between the fret and the bridge, they can be tuned much lower than the standard guitar. Hard and Heavy guitars are designed for rock and metal genres. Here you will find electric guitars such as Flying V, Explorer and others, which are commonly found in the sharpest musical genres. Complete electric guitar sets, combos and accessories are designed for beginners who want to have everything together. In the complete guitar set, you will find an electric guitar, combo, all connecting cables, picks, as well as a guitar strap and case as standard. You have everything you need to start your musical career. The basis of the electric guitar is the pickup. It consists of a magnet around which a coil is wrapped. The resulting electromagnetic field then senses the vibration of the strings, generating an electrical signal that is transmitted to the amplifier via the cable. Pickups are divided into single (singles) and double (so-called humbuckers). Typically, the pickup type can be distinguished at first glance - a single pickup is simply narrower than a humbucker. If a pickup is not under a cover, you will see a row of magnets with single ones, while the humbucker has two rows. Historically, single pickups are older. Generally, you can say that they produce a brighter, more ringing sound with a higher ratio of higher frequencies. Because of the laws of physics, they are characterized in that they produce noise. Typically, "singles" are used in pop, country, or rock'n'roll, but that cannot be said to be definitive. Humbucker pickups are developmentally younger. Their sound is rather more central, more round, and generally produces a stronger signal. Thanks to these characteristics, they are more likely to be used in jazz, blues and harder genres such as hard rock, metal, and so on. Humbucker pickups also bear stronger distortion better. At the same time you do not encounter the noise that is typical of the singles. As the name suggests, this bridge is firmly attached to the body and does not move. This type of bridge guarantees the most stable tuning and minimizes the need for adjusting. This is why guitars with a solid bridge are ideal for beginners. This is a bridge that can be moved slightly to the center of the guitar using the lever. The lever thus enables lowering the pitch of a tone during playing, which is used for various guitar techniques when playing solos and so on. This type of bridge allows you to move the bridge to both sides by using a lever. By doing so, the strings can be loosened or tightened. This motion reduces or increases the pitch of a tone, which is again applied when playing different techniques. Double-locking tremolo is also the most challenging as far as getting the tuning right goes. In order to tune a guitar with double-locking tremolo correctly (for example, after replacing strings, the instrument should be set up by an experienced guitar player or a professional guitar player. To play an electric guitar, it must be plugged into a guitar amplifier. This device can either be formed by a guitar combo (an amplifier and a speaker in one device) or a set of guitar amplifiers and cabinets. An electric guitar cannot be done without the basic accessories. First of all, you need an instrument cable, to connect the guitar to a combo or amplifier. 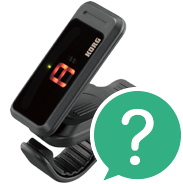 To tune the instrument you will then need a guitar tuner (any kind of clip tuner will work). You will also find picks, astrap and a guitar stand useful. If you are planning to travel with your guitar, we recommend buying a gig bag (more comfortable) or a hard case (safer). If you need some help deciding which electric guitar to buy, don’t hesitate to call us on our toll-free line at 020 8089 1481.